Graduate Student forward Bo Zeigler runs up for a dunk during Colonial Madness in October. The first time graduate student forward Bo Zeigler stepped onto the Smith Center court, he was in enemy territory. 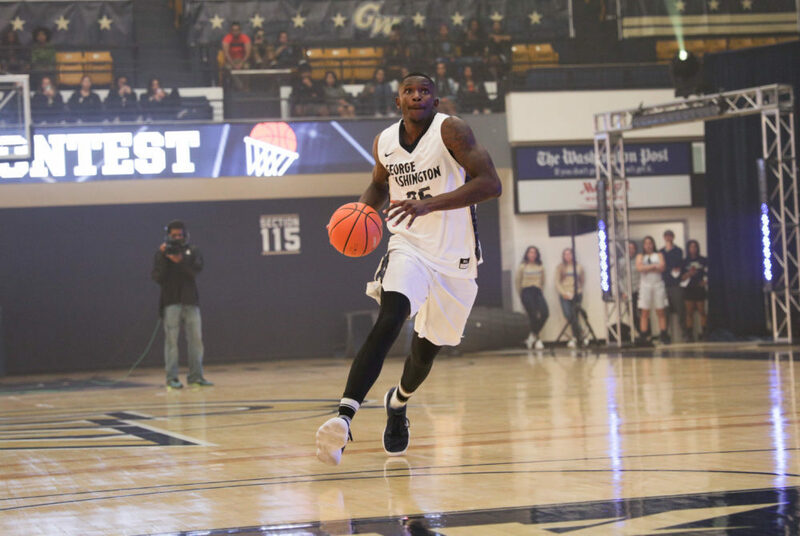 GW faced off against the University of South Florida in an early December game last year, where Zeigler was playing for the Bulls. After a tight contest, the Colonials came out on top, courtesy of a buzzer-beating, game-winning three-point shot. The memory of that game – and the high-energy atmosphere of the crowd at the Smith Center during the defeat – stuck with Zeigler, he said. Months later, when he graduated last spring, he recalled that night and decided he wanted to play on that same court again, but instead as a Colonial. Zeigler’s college basketball experience, versatile defensive skills and athleticism will make him an integral player on the court this season, head coach Maurice Joseph said. He said the team’s offensive style will be faster and more athletic than last year’s strategy. On the defensive end, Joseph said he’s looking for his team to crash the glass, fight for rebounds under the hoop and plug the holes that come with not having a true center player on the roster. As a graduate transfer, Zeigler is eligible to play for GW immediately and help make up for the team’s lack of a big man. Zeigler sees himself as a threat both offensively and defensively on the floor, he said. Zeigler’s defensive prowess adds another dimension to the team that it doesn’t have outside senior guard Yuta Watanabe, Joseph said. Out of high school in Detriot, Zeigler was ranked the No. 22 small forward in the Class of 2013 by ESPN and had offers to play at schools like Iowa State and Connecticut. In his final season at South Florida, Zeigler averaged 4.7 points per game and 3.5 rebounds, while grabbing 21 steals and 19 blocks. The Bulls went 7-23 overall in the 2016-17 season and were last in the American Athletic Conference with a record of 1-17. Joseph said Zeigler’s athleticism reminds him of former GW basketball player 2014 graduate Isaiah Armwood, who transferred into the program from Villanova. During Armwood’s senior year, the team finished with 24 wins, to which Armwood contributed an average of 12.7 points per game and 8.4 boards per game. He tallied 119 total blocks, the sixth-highest total career blocks in the program. Zeigler’s transition into the program has been smooth, in part due to his three previous years of college basketball experience, he said. Although new to the team, Zeigler hasn’t shied away from giving advice to his teammates, especially the four freshmen, he said. Just as the Smith Center’s atmosphere left an impression on Zeigler, despite only scoring four points in the game last December, Zeigler left an impression on his current teammates as well. This article appeared in the November 6, 2017 issue of the Hatchet.